Seattle Parks and Recreation and 12th Avenue Stewards invite the community to the grand opening celebration of 12th Ave. Square Park on Thursday, April 14, 2016, from 5 to 7:30 p.m. during the Capitol Hill Art Walk. Headlining the event is Naomi Wachira, winner of Seattle Weekly’s 2013 “Best Folk Singer” award. The ribbon cutting will kickoff with a trio from the Garfield High Jazz Band. 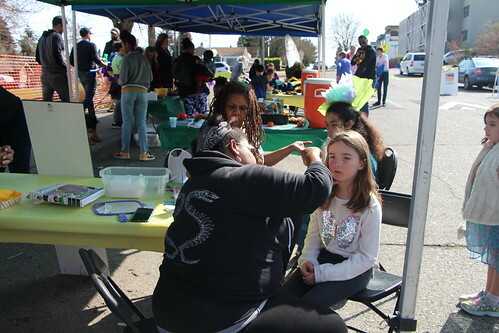 Yesler Community Center will offer a children’s craft activity. The event is sponsored in part by Swedish Medical Center Foundation and will include refreshments provided by Cherry Street Coffee, Ba Bar Restaurant, and Starbucks Coffee. 12th Ave. Square Park is located at E James Court and 12th Ave. between Ba Bar and Cherry Street Coffee House in the Squire Park neighborhood. It is a community initiated project that created a new 7,332 square-foot park and gathering space. Hewitt Architects and artist Ellen Sollod collaborated with the community on the design of the park and woonerf, which provides pedestrians and cyclists priority on the street. This technique of shared spaces, traffic calming, and low speed limits contribute to improved pedestrian, bicycle, and automobile safety. The artistic sculptural canopy structure in the park is called “Cloud Veil.” It hovers over a rounded “pillow” and wavy concrete paving. Several other smaller pillows for seating are sprinkled through the space. The park’s unique design also includes rain gardens to extend the feeling of open space for the entire block on E James Court, a single east-bound lane. 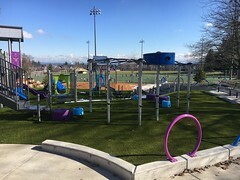 The creation of this new public space was made possible with funding from the Seattle Parks and Green Space Levy Opportunity Fund, the Pro Parks Levy Opportunity Fund, Seattle Department of Neighborhoods, Neighborhood Parks and Streets Fund, and Seattle Parks Foundation Stim Bullitt Parks Excellence Fund. For more information about the park or to get updates on the upcoming event, please visit http://www.seattle.gov/parks/ProParks/projects/12thAve.htm or contact Karen O’Connor, Seattle Parks and Recreation, at karen.o’connor@seattle.gov or 206-233-7929 . Seattle Parks and Recreation invites the community to participate in the first public meeting for the John Street Enhancement Opportunity Fund project on Tuesday, June 18, 2013 at 6:30 p.m. Parks will host the meeting at the Capitol Hill Branch Library located at 425 Harvard Ave. E. This community initiated project is located adjacent to Summit Slope Park on Capitol Hill. At the meeting the community can provide input on adding more green space in the street right-of-way and comment on changing traffic and parking on a short portion of E John Street between Summit Avenue E and E Olive Way. Seattle Parks staff will present site analysis and schematic design alternatives that include the addition of a bio-swale or rain garden along the sidewalk, additional green space, and changes in traffic and parking in the street right-of-way. Staff will answer community questions and gather input on the project. 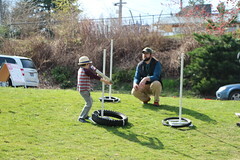 or contact Rick Nishi, Parks and Green Spaces Levy manager at 206-733-9319 or rick.nishi@seattle.gov. 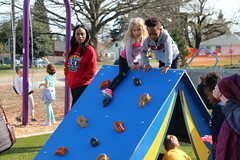 Seattle Parks and Recreation invites the community to the final meeting for McGilvra Place Park on Tuesday, April 24, 2012 from 6 – 7:30 p.m. at the Seattle Academy 1432 15th Ave., Seattle, WA 98122. At this meeting, Parks and The Berger Partnership will update the community on the final project design. McGilvra Place Park is located at the intersection of E Madison St., E Pike St., and 15th Ave. This project provides a more accessible and useable site with a pedestrian oriented street along 15th Ave, and will employ green construction methods. Seattle Parks and Recreation invites the public to submit potential names for a new park in the Capitol Hill neighborhood. Suggestions for names are due to the Park Naming Committee by Monday, December 12. Federal and Republican: The property at the corner of Federal Avenue E and E Republican was purchased in March 2010. This acquisition helped fill a need for open space in the Capitol Hill Urban Village area. In 2011, the Friends of Federal and Republican Park received a Neighborhood Matching Fund award and hired SiteWorkshop to work with the community in preparing a schematic design. Three public meetings were held, with the goal of designing and building a new neighborhood park that is welcoming for all neighbors. The preferred schematic has been developed. It has a large lawn area, seating at a “front porch” area at the top of the site and on a seat wall alongside the sidewalk. There will be community gardening (as part of the P-Patch program), opportunities for natural play and artwork. The design development phase is underway. Details such as materials, artwork, natural play features, gardening and other particulars will be determined over the next few months. Friends of Federal Republican Park won a $10,000 Build Your Block Challenge Award from Umpqua Bank. This will help with initial landscaping needs for the park. The community is working on additional grants and private fundraising with the hope of beginning construction in 2013. 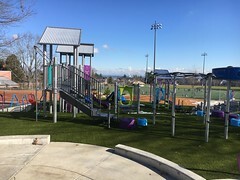 The Park Naming Committee is comprised of one representative designated by the Board of Park Commissioners, one by the Chair of the City Council Parks and Seattle Center Committee, and one by the Parks Superintendent. Criteria the committee considered in naming parks include: geographical location, historical or cultural significance, and natural or geological features. A park may be named for a person no longer living (deceased a minimum of three years) who made a significant contribution to parks and/or recreation. The Park Naming Committee will consider all suggestions and make a recommendation to the Superintendent, who makes the final decision. Please submit suggestions for a park name in writing by December 12, 2011, and include an explanation of how your suggestion matches the naming criteria. Send suggestions to Seattle Parks and Recreation, Park Naming Committee, 100 Dexter Ave. N, Seattle, WA 98109, or by e-mail to paula.hoff@seattle.gov. In keeping with Seattle’s “Paper Cuts” program, Parks encourages electronic submissions. The Capitol Hill neighborhood is invited to join Seattle City Councilmember Sally Bagshaw, Seattle Parks and Recreation, and Seattle Department of Neighborhoods’ Howell Collective P-Patch for an opening celebration at the new Seven Hills Park. The community potluck is Thursday, September 9, 2010, beginning at 6 p.m. at 1514 E. Howell. Both the acquisition and development of Seven Hills Park were funded by the Pro Parks Levy. What was once a parking lot is now a new community park. This new neighborhood gathering space features an open lawn bordered by the Howell Collective garden to the north and a crushed rock plaza and pathway lined with trees to the south. Other elements include barbeques, picnic tables, benches, and an art element. The art element, “Seven Hills of Seattle,” designed by Mithun Landscape Architects, includes a grouping of seven boulders for creative play and seating that represents the seven hills of Seattle, called out in an effort by early 20th century civic boosters to liken Seattle to Rome. Howell Collective is the newest addition to Seattle Department of Neighborhoods’ P-Patch Community Gardening program. At the Howell Collective, gardeners will not have individual plots, but, like at every P-Patch community garden, they collectively design, plant, maintain, and harvest together. For more information, please see Howellcollective.wordpress.com or www.seattle.gov/neighborhoods/ppatch/. The lawn is fenced to protect the newly planted turf. It will be open to the public in the early spring when the grass has become fully established. Approved by Seattle voters in 2000, the $198.2 million Pro Parks Levy funded more than 100 projects throughout the city over eight years. 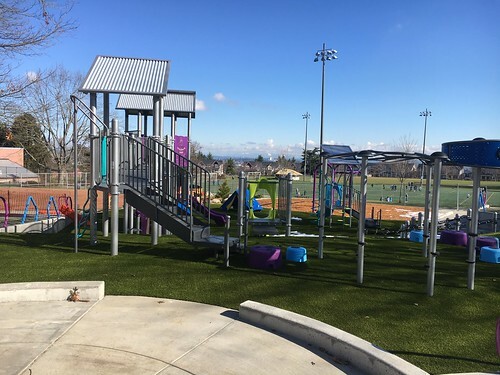 Projects include improvements to athletic fields, playgrounds, trails and community centers and parks. Funding also increases green spaces, support Zoo programs and enhance park maintenance. For more information, please contact the Parks Project Manager at virginia.hassinger@seattle.gov or 206-233-7936. For information on Howell Collective visit howellcollective.wordpress.com. Seattle Parks and Recreation has reached agreement with the owner of a 12,000 square foot property, located at the northeast corner of Federal Ave. E and E Republican St. on Capitol Hill, to purchase it for use as a park. The parcel was suggested for purchase several years ago, as the 2000 Pro Parks Levy was ending, but there were no funds available to buy the property at the time. A developer purchased the site, demolished the existing structures, and obtained permits to build townhomes. Voters approved the 2008 Parks and Green Spaces Levy in November of 2008, and in the meantime the property changed hands again, to another real estate developer who intended to proceed with residential development. By this time the site’s potential as a public park were evident since it was now a vacant site. The 2008 Parks and Green Spaces Levy includes funds to purchase neighborhood park sites in densely populated urban villages with service gaps, including the northeast quadrant of the Capitol Hill Urban Center Village. Parks hosted a public meeting in early 2010 and invited the community to discuss the possibility of acquiring the property. More than 70 people attended and showed enthusiastic support for its purchase for a park. Though the developer was poised to proceed with development, successful negotiations led to an agreement on the City’s purchase of the property, and Parks expects the transaction to close later in June. Seattle Parks and Recreation invites the community to participate in planning the future park at 12th Avenue and E James Court. The first public meeting is Tuesday, May 18, 2010 at 5:30 p.m. at Seattle University Admissions and Alumni Building, 824 12th Ave. During this meeting Parks staff will outline the project scope and schedule, and listen to what the community priorities are for transforming this site into a neighborhood gathering space. 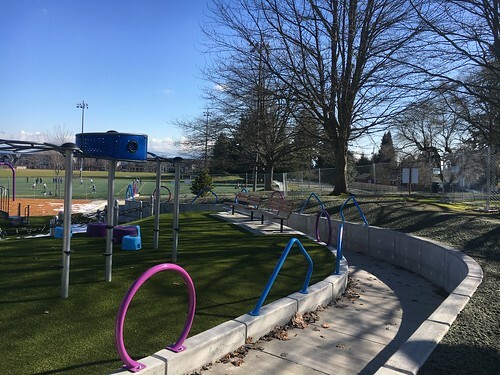 Seattle Parks and Recreation contracted with Hewitt Architects to design the 7,332 square-foot property at the southeast corner of 12th Avenue and E James Court. This new park space was transferred to Seattle Parks and Recreation from the Department of Neighborhoods in January 2008. Parks removed a building from the site. Planning, design and construction of this project is being funded through a variety of City sources, including Seattle Department of Transportation and the Department of Neighborhoods. For additional information about the project please visit http://seattle.gov/parks/ProParks/projects/12thAve.htm or contact Susanne Friedman, Parks Planner at 684-0902 or Susanne.friedman@seattle.gov.